Mr Nasser Boladai, President of the Unrepresented Nations and Peoples Organization (UNPO) and Spokesperson for the Balochistan’s Peoples Party, visited Washington DC for five days in July 2016. Through targeted advocacy meetings, the delegation was successful in raising awareness of the human rights situation in the Iranian and Pakistani parts of Balochistan, and promoting the establishment of Baloch language broadcasting with Voice of America among policy-makers at the Hill. During their 5-day visit to Washington DC, the delegation met with Members of Congress and the US Senate, State Department staff, USAID officials, as well as experts of various think tanks. The advocacy meetings were an opportunity to renew pre-existing contacts with US policy-makers and government officials supportive of the Baloch cause, and to establish new ties in the DC circles to explore future avenues for dialogue and cooperation. The delegation’s visit was in continuation of previous rounds of advocacy meetings in May 2016 and November 2015, both of which had as their aim to sensitize US policy-makers and government officials for the problems associated with the 2015 Iranian Nuclear Deal, most notably the fact that it prioritizes economic benefits over addressing blatant human rights violations perpetrated by the regime in Tehran against the various nationalities of Iran. Apart from ethnic, cultural and religious discrimination against all non-Persian ethnic groups, the government uses brutal methods to terrorize and instil fear among those marginalized groups it is supposed to protect. Blatant human rights violations committed by the regime include enforced disappearances, torture and extra-judicial killings. The Baloch in particular are disproportionately affected by extra-judicial executions. Just as during previous rounds of advocacy meetings in DC, the issue of terrorism was raised. The delegation once again expressed their concerns that in both Iran and Pakistan the Baloch people are on the frontline in the fight against terrorism and extremist forces, thus warranting greater support to the beleaguered Baloch from the U.S. government. Closely related to this aspect is the geopolitical and strategic importance of Balochistan, along with the region’s rich endowment with natural resources. The delegation discussed with US policy-makers the deplorable fact that these valuable features of Balochistan are exploited by the regional powers, who offer no compensation in return while, at the same time, brutally suppressing anyone who dares calling attention to this daylight robbery, and systematically changing the region’s demography. The delegation urged that continued financial support and political concessions to the Iranian and Pakistani government respectively must be made conditional on improving the human rights situation in Balochistan. Another key issue the delegation discussed with members of Congress and Senate was the funding of Baloch language broadcasting. The delegation reiterated the pressing need for the Baloch to have access to a free and independent media in their own language. Currently, state-sponsored media in both Iran and Pakistan are dominated by religious sectarian narratives that are often violent in content. The Baloch find themselves targeted on all sides by media that promote extremist ideologies and non-liberal values. Native language broadcasting would undoubtedly help to provide the Baloch with non-biased news and democratic values. 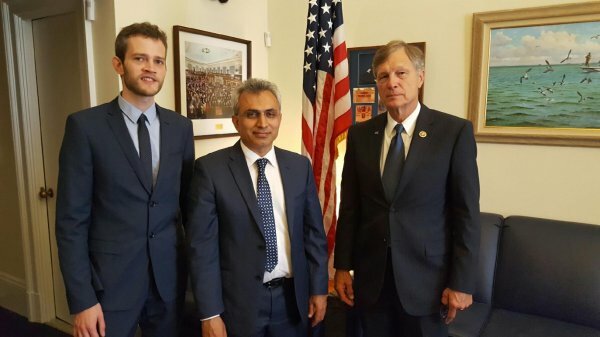 The delegation clearly made headway in promoting the idea of Baloch language broadcasting among US policymakers and is particularly grateful for Congressmen Steve King’s and Dana Rohrabacher’s support in this matter, the latter publicly urging VOA to initiate native-language broadcasting to Balochistan.